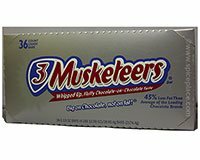 3 Musketeers® Bars - Whipped up. Fluffy Chocolate - on - chocolate taste. Big on Chocolate. Not on Fat®. 45% less fat than average of the leading chocolate brands. Ingredients: Milk Chocolate (Sugar, Chocolate, Cocoa, Butter, Lactose, Skim Milk, Milk Fat, Lecithin, Artificial and Natural Flavors), Sugar, Corn Syrup, Partially Hydrogenated Soybean Oil, Less Than 2% - Cocoa Powder, Processed With Alkali, Salt, Egg Whites, Artificial Flavor. Allergy Information: Processed in a facility that uses peanuts. Contains Milk, Eggs and Soy.